David Klech and Anne St. Geme win MVP honors. Klech (left) doubles in hurdles, including US#4 all time 35.45 300H. St. Geme (right) wins mile in meet record 4:46.10 and 2 hours later anchors a come from behind DMR victory for Corona del Mar in 11:42.86 US#7 all time. 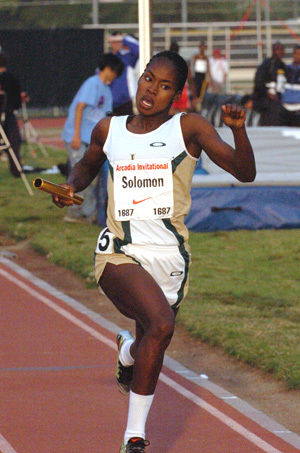 2004 on DyeStat - Poly Long Beach girls sweep relays from 4x100 to 4x800, with one national record and two US#6 all time marks - Shalonda Solomon 11.50 US#1 - Elzie Coleman doubles 200-400 - Katelyn Kaltenbach over Zoe Nelson in great battle of Foot Locker champs - Ryan Deak catches Laef Barnes in mile - Andrew Bumbalough 8:49.87 beats Shadrack Kiptoo in super 2-mile - Nicole Leach 53.58 - Erica McLain 43-0.5 TJ - Dan Hutson 1:51.79 - Nate Rolfe 204-0 first throw discus win - Poly Long Beach boys win 4x400 finale over Glenville OH by 0.002 - Don Lugo CA boys double in 4-Mile relay and DMR. 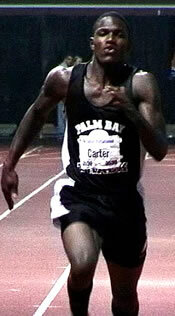 2003 on DyeStat - from left, Xavier Carter gets first sprint triple at Arcadia. 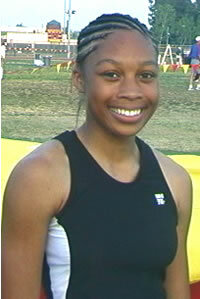 Allyson Felix matches Marion Jones' sprint three-peat. 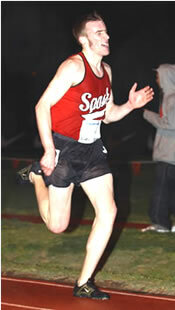 Chris Solinsky dominates best 3200 ever. 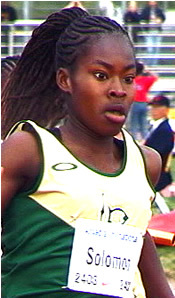 Poly Long Beach girls 4 relay wins including US record 800 SMR and US#2 all time 4x100. 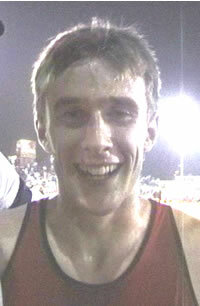 2002 on DyeStat - Boys: Chris Solinsky 8:48.44 in deepest 3200m in years: (Bret Schoolmeester 8:49.40, Billy Nelson 8:54.85, Brett Gotcher 8:55.09) (Athlete of the Meet). 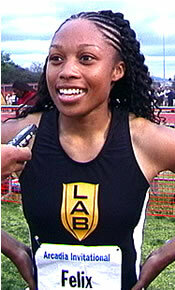 Girls: Allyson Felix 11.54 +0.2 and 23.08 -0.1 (Athlete of the Meet). 2001 on DyeStat - Alan Webb runs away from star studded mile field in last 200 meters. Soph Megan Kaltenbach wins first of three straight Arcadia 3200's. 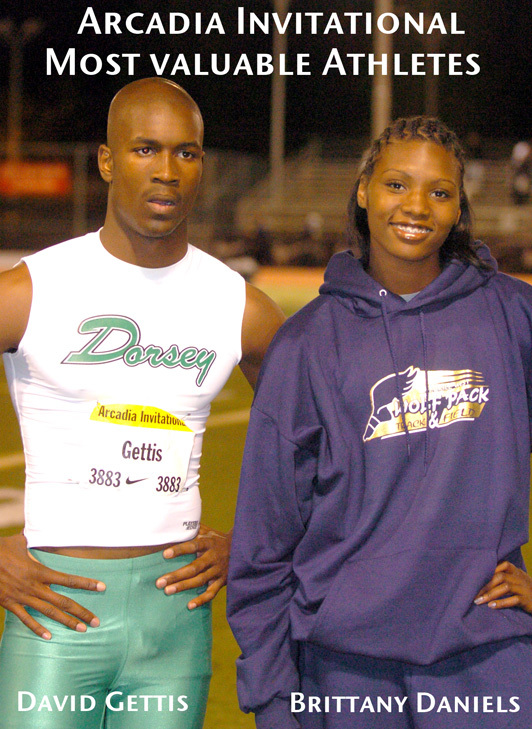 2000 on DyeStat - Ricky Harris 13.51 110H and 47.04 400m and Lashinda Demus 40.97 300H. Ale Barrientos 4:46.60 mile. 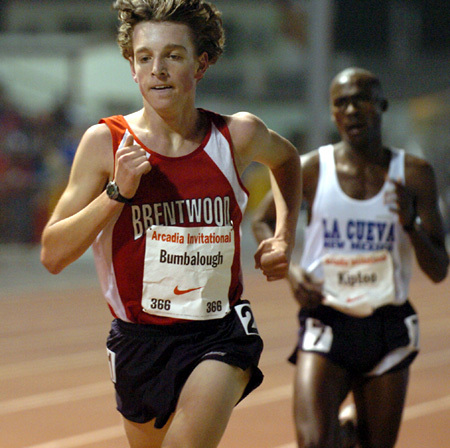 1999 on DyeStat - Casey Combest vanquished in Darrell Rideaux's lions den. Erica Whipple 11.57 and 23.46. Coming out party for soph Ale Barrientos 4:47.94 1600m.